Figure A87. Tonga-Kermadec-Hikurangi anomaly, interpreted as the Tonga-Kermadec-Hikurangi slab, with (horizontal) [vertical] cross sections through (A)[D] the UUP07 p-wave) and (B)[D] the combined SL2013 and S40RTS s-wave models at 330 km; C) the location of the modern geological record that we interpret to have formed during the subduction of the slab. The Tonga–Kermadec–Hikurangi anomaly (Figure A87) is located below the south Fiji Basin in the upper mantle and the upper part of the lower mantle up to a depth of ~1200 km. It was interpreted in the uppermost lower mantle as a single N-S trending slab by van der Hilst (1995), Bijwaard et al. (1998), Fukao et al. (2001), Hall and Spakman (2002; 2004), Gorbatov and Kennett (2003), Schellart et al. (2009), Schellart and Spakman (2012), and Fukao and Obayashi (2013). In the south, the Kermadec section of the slab penetrates almost straight through the 660 km discontinuity, but northward, a horizontal section of the slab, overlying the 660 km discontinuity becomes prominent. This is explained by increased eastward roll-back of the slab towards the north around an Euler pole relative to the mantle close to the southern tip of the slab in the Hikurangi segment (Schellart and Spakman, 2012). The onset of subduction along the Tonga-Kermadec-Hikurangi subduction zone is debated. Hall (2002) suggested a 45 Ma onset based on the onset of Pacific-Australia convergence, whereas Schellart et al. (2006) suggested that westward subduction along the Tonga subduction zone had been ongoing since at least 85 Ma. Recently Wu et al. (2016) suggested 50 Ma as a start and on the basis of the LLNL-G3Dv3 tomographic model of Simmons et al. 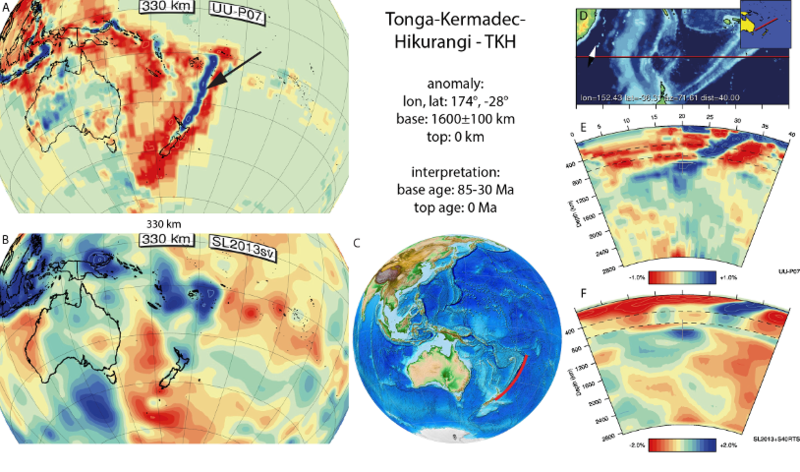 (2012) that the Tonga-Kermadec Hikurangi slab at ~1000km depth may be connected with the central Mariana slab. Prior to 50 Ma Wu et al. postulate that a western Pacific plate boundary already existed but was this may have been characterised by highly oblique subduction or transforms. After 50 Ma, Pacific plate motions changed and fast subduction began below the Philippine Sea Plate (Wu et al. 2016). Geochemical analysis of dredge samples from the Tonga forearc found the first evidence of arc magmatism around 50 Ma (Meffre et al., 2012), although these may be interpreted to reflect the initiation of the New Caledonia subduction zone, correlated to the South Loyalty Basin slab (Schellart et al., 2009). In a recent plate kinematic analysis, van de Lagemaat et al. (2017) showed that when subduction of the South Loyalty Basin slab along the New Caledonia trench is taken into account, there is no or little convergence across the Tonga Trench until as young as 30 Ma, and argued that correlating the onset of Tonga-Kermadec subduction to subduction initiation at the Philippine Sea Plate at 52-51 Ma, or to the onset of Pacific-Australia convergence at 45 Ma is kinematically unlikely. Given the ongoing debate on the age of subduction initiation, we adopt a wide age range of 85-30 Ma for the onset of the Tonga-Kermadec-Hikurangi subduction zone.